Newsletters: The Ararat North Primary School Newsletter is published monthly and delivered to families in hard copy via the eldest child. Parent Portal: Our school uses an online communication system called uEducateUs. uEducateUs provides easy access to important information for the people involved in a student's learning and well-being. This includes communication tools which make it simple for parents to access newsletters, permission slips and reporting updates. Facebook: Our school has a regularly updated Facebook page which celebrates daily happenings at Ararat North Primary School. Some important reminders are also posted. 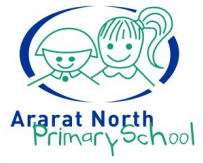 You can find us at: www.facebook.com/AraratNorthPrimarySchool.